In the last two workshops (September 6, September 13) using wands was brought up. I thought it might be good to discuss the different kinds of wands, as I do use them frequently myself and there may be an interest in these devices. You may think that a master reality creator would not need such things, but my philosophy is to utilize anything that makes things easier, and wands make some things easier. On the right is a picture of 4 wands. The most useful wand to me is the one on the left. It's a healing wand (green one). I use this to unblock energy in my body, like in a sprain or injury, or cut out an infection, or to just reroute energy that seems to be going in the wrong place. This wand I did not make myself and was a gift, but I did make the other wands pictured. The healing wand has a Lemurian healing crystal at one end and a rose quartz sphere at the other. Those stones are mounted in a metal tube and wrapped in leather. My least used wand is the next one from the left pictured. It's a caduceus wand (white). It's more ceremonial that functional, even though it has one crystal at each end and two crystals mounted on the twin snakes. I use this wand for balancing energy. The next wand over (the black one) is my fire wand. I use this wand almost as much as the healing wand. It is also made of copper metal pipe has a foam handle, and a crystal at the top. This wand has batteries, a light behind the crystal and creates a magnetic field that helps tune this energy. You can make just a basic fire wand with a copper tube, wrap it in leather, and put a crystal at one end. I use the fire wand to charge talismans, crystals, objects, pendents. The final wand all the way on the right is my rainbow wand. 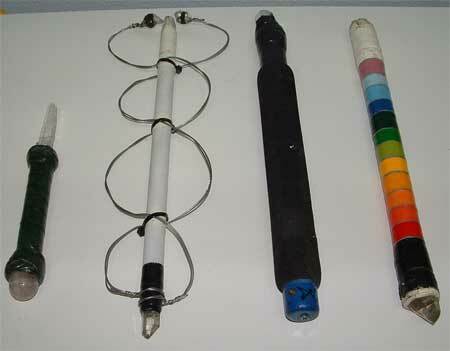 It has a crystal at each end mounted in a copper tube and is wrapped in plastic electrical tape, then painted. I use this when working with cosmic energy or when trying to balance the Zodiac energies. It is also good for charging the self with energy by holding it over your head with the white end facing up and the black end down. Wands do not require crystals nor do they have to be made of metal. You can use a mere tree branch as a wand. A wand is an extension of yourself. It helps you to focus your energy and direct it. As the wand is made from elements of the earth, it helps you to wield your energy on the earth. Adding things like crystals, power sources, or decoration just help make the wand gather more energy. I find it easier to construct wands made of metal but wood wands work just as well, maybe even better in some uses. I always suggest that the student make at least one wand themselves. But you can buy already made quality wands if you are not handy with wood or metal. If you do make the wand yourself you get the extra boost of bonding with the device as you make it and you can personalizing it just the way you want it.